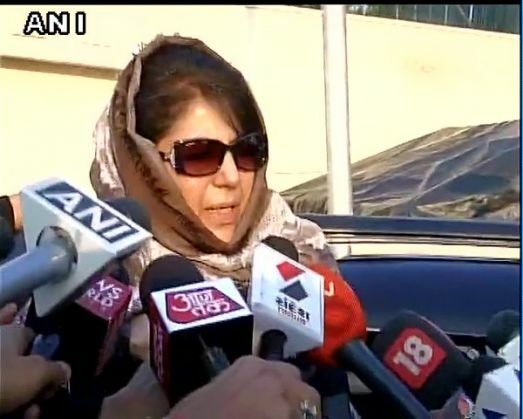 In a secret meeting in Srinagar on Wednesday evening, BJP general secretary Ram Madhav spoke with Peoples Democratic Party (PDP) president Mehbooba Mufti hoping to end the stalemate between the two partner-parties of the Jammu and Kashmir government, reports The Indian Express. Madhav had negotiated the alliance between the BJP and the PDP last year. He arrived at the Muftis' residence in Srinagar around 6.30 pm, accompanied by another person whose face was covered with a shawl. The meeting lasted about an hour. "The meeting was due for some time now. We believe that he (Madhav) has just come with a message from the top leaders (Prime Minister Narendra Modi and BJP president Amit Shah)," a PDP leader said. "The results are expected soon". Madhav's arrival in Srinagar was kept secret even from senior PDP leaders, many of whom were out of town. Mehbooba Mufti, who had taken over leadership of the PDP after the death of her father Mufti Mohammed Sayeed in January, had stymied both parties in the alliance by refusing to form a government. The state has been under Governor's Rule since Mufti Sayeed's death. Mehbooba had refused to form a government with the BJP until certain conditions were met. Ram Madhav's visit is the first formal step by the BJP towards government formation in Jammu and Kashmir since Mehbooba made her conditions. "As far as government formation is concerned, we have entered into a crucial phase," said a PDP leader. "I think, it would be decided in a week's time whether we form the government with them (BJP) or not. It will all depend on how the BJP reacts to our demands."